With about two weeks before Valentine's Day, and two more In The Kitchen With Scotty cooking segments before Cupid makes a showing, I thought I would offer up some tasty ideas for you and your special somebody. Now I’m not mad at a box of Godiva candies on Valentine’s Day… not that anyone has ever given me a box of Godiva candy on Valentine’s Day…or ever….. BUT! I have a great way to make your Valentine’s Day giving a little more special this year for your special someone by making a pan of deliciously sweet and beautiful Torrone candy. 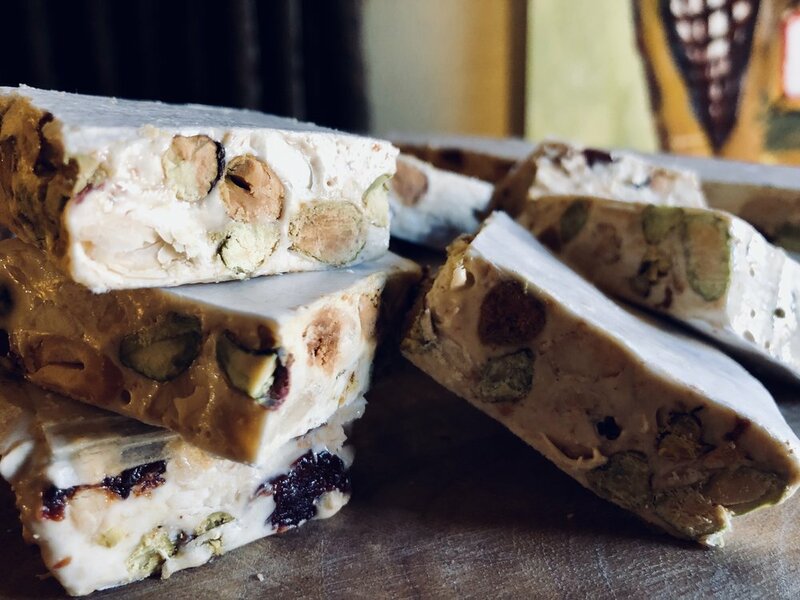 Torrone (and yes, you have to roll your “r’s” when saying torrone) is a wonderful Italian nougat traditionally made with honey, roasted almonds, pistachio and lemon zest. Trust me, you are limited to those items…Dried fruit is wonderful in torrone as well. Dried cherries marinated in a Luxardo Maraschino liqueur is EXCEPTIONAL! Somethings to know when making torrone and any nougat candy… it takes a lot of stirring. 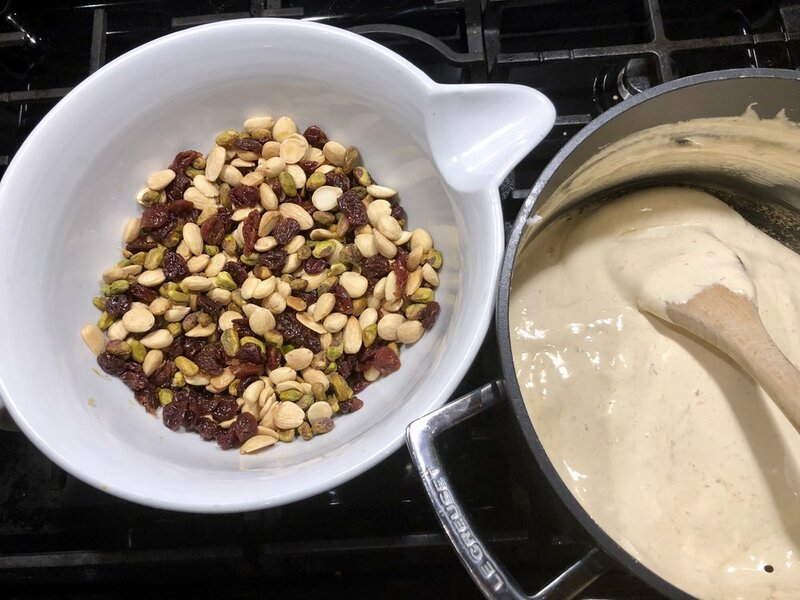 There are easier ways of making a nougat, sort of along the lines of making Swiss meringue, with a genius contraption called an ELECTRIC MIXER. I think hand stirring and cooking your honey, hand whisking your egg whites, and then cooking back into the honey, makes a great “couples” project for you and your significant other. Picture it: Wine, jazz playing in the background, taking turns stirring… and stirring… and stirring while sharing each other’s company. Doesn’t that sound perfect? The twist to my torrone is the addition of marinated dried cherries in Luxardo liqueur .. and THANK YOU SHOUT-OUT Modern Liquors (2918 N. Pennsylvania Ave. OKC) the handy neighborhood spot for all of my Spirit-ual needs, for ordering me a bottle of Luxardo after they sold their last one… and making sure that there are plenty if anyone else needs a bottle of this magical cordial. Anyway… marinate the cherries! Luxardo liqueur is the “Big Daddy” way for making cocktail cherries, and the kick it gives to this torrone is magical! Marinating the dried cherries with lemon zest, vanilla, and sugar. Starting out the honey and sugar together over low heat. Adding one spoonful of whipped egg whites and mixing in a little at a time. After pressing the torrone into your prepared pan, top off with the second sheet of wafer paper. Begin by preparing your pan for the torrone. Drape a sheet of plastic wrap on the inside of an 8x8 up to an 8x11 pan. Make sure the plastic rests on the bottom and sides of the pan easily. One sheet of the wafer paper (trimmed if needed) to fit in the bottom of the pan, and the other to rest on top of the candy. Wafer paper is totally edible, made of rice, and gives the candy a nice clean-cut and smooth top/bottom. If you cannot find the paper ( I ordered mine from Amazon) you may simply spray plastic wrap with cooking spray. Lay the bottom piece of wafer paper in the bottom of the pan and set the top piece aside. *Next, begin to soak your dried cherries in a Luxardo liqueur marinade no less than 3 hours up to overnight, preferred. In a bowl, add the 1 cup of dried cherries. 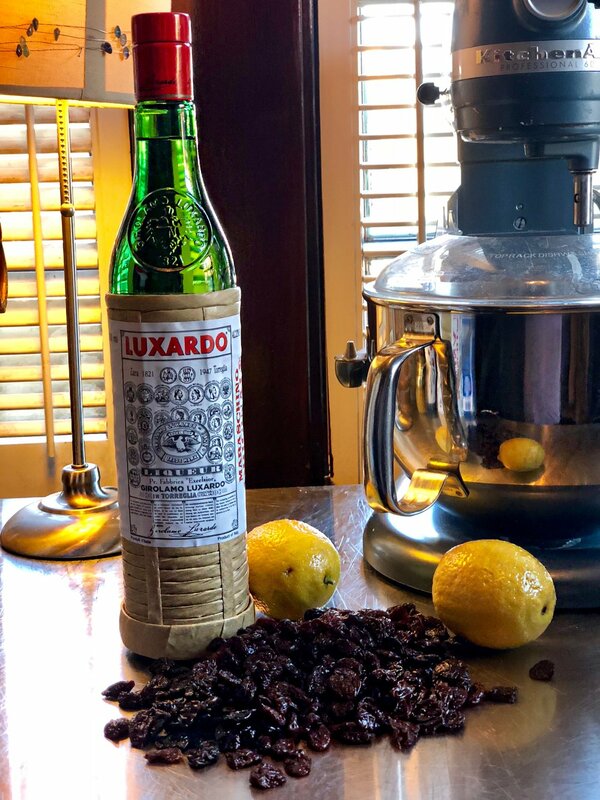 Pour in the Luxardo liqueur, along with 2 tablespoons of granulated sugar, the vanilla, and lemon zest. Mix it all to combine, wrap the top in plastic and allow the cherries to marinate and plump a bit. After marinading the cherries drain (reserve the liqueur if you want to add it to your next cocktail) and set the cherries aside. If you choose not to use Luxardo just use the cherries, lemon zest, and vanilla in with the candy. No need for the extra sugar. In a medium-large soup pot add the honey and begin to heat and “loosen” the honey. Add the sugar and mix in. Set your timer for 30 minutes. Over low gentle heat cook and stir the honey and sugar to a nice semi-thick and lightly bubbling concoction for thirty minutes, semi-constantly. That means you don’t have to continuously stir but don’t “not stir” for any time over two minutes. The idea is to cook the honey mixture and not to scorch it. In an ovenproof bowl add the almonds, pistachio, and cherries. Place the bowl into the oven set at it’s lowest temp (150-200 degrees). When it comes time to mix in the nougat having the warm nut mixture will make this process easier. Don’t let it set in there so long that it “cooks”.. just long enough to heat. While your honey is cooking and with around 10 minutes left on the clock, begin whipping your egg whites with a pinch of Kosher salt to soft peaks. Like Chef John says, until it resembles shaving cream. This part would be handy if you had a partner in the kitchen with you. One could cook and stir while the other one whipped. I’ll leave that “task” up to the imagination of you two lovebirds. Once the honey is cooked, lightly thickened and pale, one spoon full at a time add in the whipped egg whites and stir in immediately. Continue adding small spoonfuls, string in and cooking all of the egg whites until they are incorporated. You will notice how light and thick the nougat is now becoming. Cook until the nougat is like thick airy marshmallow… about an additional 12 minutes after all the egg whites have been incorporated. Remove the warm bowl of nuts and marinated cherries from the low oven. Sprinkle in the orange zest. (This would also be the time if you were not marinading the cherries to add the dried cherries, lemon zest, and vanilla.) Pour in the cooked nougat and begin folding it in with the nut and cherry mixture. Be sure to go all the way to the bottom of the bowl and around the sides to make sure all the “goods” have been enveloped into the beautiful nougat that you just worked so hard to make. Spoon it all out into your prepared pan with the wafer paper bottom. With a clean spatula or metal spatula smooth and press the nougat into the pan evenly. Be sure to even it out and press into the bottom and sides of the pan. This is sticky-business so spraying your spatula with cooking spray makes the task a lot easier. Once evenly in the pan and the top is mouthed off add the second piece of wafter paper on top and firmly press down. Let the Torrone cool on the counter to room temp then place in the fridge, or leave it out for a few hours to firmly set. Once set remove from the pan with the aide of the plastic wrap. Remove the plastic wrap because it is inedible. Keep the Ric paper on because it is edible and gives the torrone a nice finish. Cut the torrone into 1 -2-inch squares and share with those you love. Cut the torrone into any size or shape you like. A sweet and delicious labor of love... made together or for your someone special.